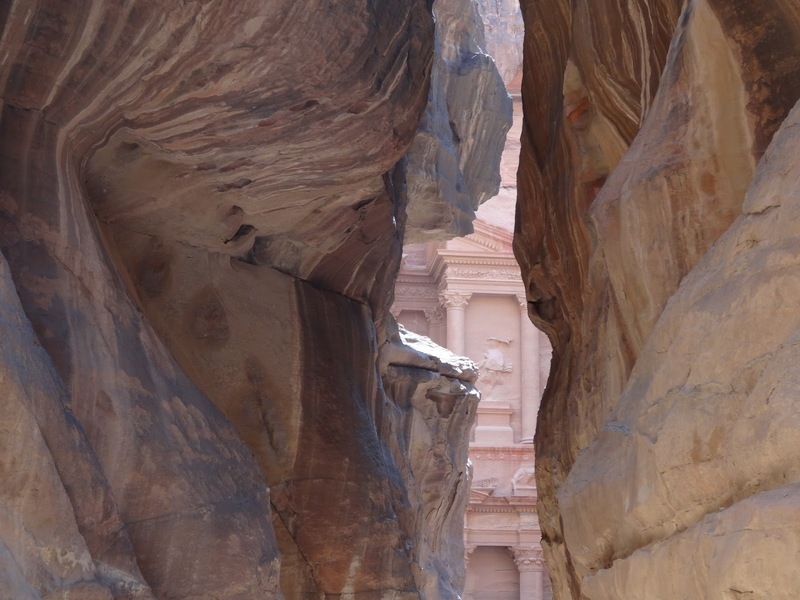 The Treasury in Petra, Jordan after a very long, hot walk. Click here for one of two posts. This sight made us gasp with our hearts pounding wildly, less from the walk, more from sheer joy! Frequently, we receive email inquiries from our readers asking for suggestions for the best places to visit in the world based on what we've seen to date. That's a tough question to answer. Its almost as complex as asking a person what they like to read, to eat and what they prefer for recreation. Its all a matter of personal preference. Zef, our houseman, held this monstrous insect Tom had fished out of the pool with the net. Not only did living in Marloth Park include daily visits from big wildlife but also the smaller world of many insect such as this enormous rhino beetle. For more details, please click here for one of our three months of posts. Keeping in mind that our primary interests (although we've enjoyed many other aspects in the world which we'll also include here) revolve around observing wildlife, vegetation and naturally created scenery which limits more than half of the popular "places to see" in the world. With our goal to visit every continent, choosing countries/regions within that continent we strive on making decisions befitting our personal interests. To date, we visited 49 countries as shown in our map on Travelers Point. Please click here to see our map. 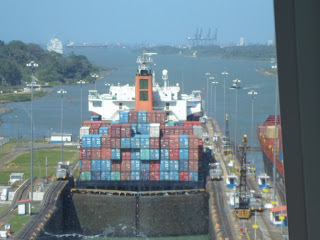 A container freighter ahead of us in line to enter the first set of locks, the Miraflores Locks as we entered the Panama Canal. See here for one of the posts. When reviewing our map its clear to see how we've yet to visit most of Asia (we'll be visiting a few Asian countries soon), South America (upcoming in 2017) and Antarctica, upcoming in 2017 or 2018 (cruises yet to be posted). Sure, we've found many big cities interesting, romantic and exciting: Paris, London, Sydney, Vancouver, Barcelona, Dubai, Venice, Marrakesh, Cairo, Dubrovnik (Croatia), Reykjavik, Cork (Ireland) and on and on...too many to list here. This female lion as all animals in the wild in the Masai Mara, Kenya, is constantly on the lookout for the next meal to feed her cubs. It was a memorable, life changing experience we'll always treasure. See here for more details. 2. Panama Canal cruise: Making a transit through the canal is quite an experience. The cruises include many stops to other interesting countries. 3. Masai Mara, Kenya: Photo safari one of the top experiences in our lives; pricey. 4. Petra, Jordan: Visit the Treasury, one of the most amazing man made structures in the world, breathtaking. Getting there can be pricey. 5. The Middle East cruise: (May not be safe at this time). Traveling through the Red Sea, the Suez Canal (loved this) and the Gulf of Aden proved to be our most adventurous cruise to date. After we traveled through the Suez Canal, we entered the dangerous waters of the Gulf of Aden, requiring "pirate drills" and special forces onboard with the "packages" including armory to protect the ship and passengers. Very exciting. See the post here. 6. Venice, Italy: Amazing, must-see for those who don't mind "tourist" attractions with huge crowds, long queues, and bumping elbows. 7. Mykonos, Greece: (Sardinia is reputed to be even more exquisite). Mykonos has gorgeous scenery, interesting shopping, great restaurants with many delightful hilly walks. Expensive. 8. Placencia, Belize (a peninsula): Our first stay outside the US with a bad start for during the first week in a less desirable house - moved to fabulous property - remote, had an exquisite stay; great people, reasonably priced. Quiet life with a week or two of sites to see. There are many islands in Belize such as Ambergris Caye that tourists often choose over Placencia. We prefer more remote locations. Not recommended for those with precarious health issues when its a rough four hour drive or an infrequent flight on a small plane at a local airport to a hospital in Belize City (city is rough and best to avoid for extended periods). As our ship made its way to the port of Venice, our mouths were agape in surprise a the feast before our eyes. Click here for one of two posts. 9. Sydney, Australia: One of the most beautiful cities in the world; expensive, good local transportation, fabulous shopping, hotels and restaurants, lots to see, far to travel from many parts of the world. 10. New Zealand: This country has so much to offer one could easily stay busy and in awe for many months touring both the North and South Islands, especially if you enjoy road trips. For us, staying close to New Plymouth and the alpaca farm has totally fulfilled us, although we plan to do some touring in the near future. Reasonably priced. The Harbour Bridge. Wow! It was extraordinary. We look forward to returning to Sydney in 2017 for 40 days to fill a gap in our schedule. For the link to this post, please click here. 11. Dubrovnik, Croatia: The must-see walled city may not require a long stay but a few days to a week could be highly gratifying. Pricey. 12. The countryside in France and the UK: We've visited many small villages but will someday return for a more comprehensive tour. Expensive. 13. Kauai, Hawaii: Extraordinary island offering the "naturalist" a wide array of sightseeing opportunities, scenery and unique wildlife. Expensive. The walled city of Dubrovnik, Croatia. For more photos of this breathtaking historic city, please click here. We could go on and on. We've provided a few links in the caption of today's photos for our visits to these special places. If you'd like to see more photos, please search on the right side of our daily homepage and you'll find a 'SEARCH" box directly below the listed archive dates (for more past posts). If you'll type in the name of any of the above cities/countries/locations, you'll find a list of every post in which we've visited these areas. If you have difficulty with this, please send an email and we'll be happy to assist in finding the appropriate posts containing many photos. Not wanted to awaken her/him, I kept my distance although I'd have loved to see more of the rarely seen Hawaiian Monk Sea at the beach at the Napali Coast, Kauai. Click here for more details. Actually, it would take writing a comprehensive travel book to describe the details of these experiences and more. Instead of writing a tedious time consuming book, we've chosen to share our story each day. For now, our goal is to assist our inquiring readers on areas they may find suitable for their needs and desires. We hope today's story helps for those who are considering traveling if possessing some criteria similar to ours. Have an interesting day whatever you choose to do! A final view of Hanalei Bay before we exited an open house in Kauai. For photos of the house we toured, please click here.